Role of MRI in planning radical prostatectomy: what is the added value? The goal of radical prostatectomy is to eradicate oncological disease while achieving the best possible functional outcomes. In this regard, nerve sparing offers a greater chance of recovering potency after surgery. Accurately locating prostate cancer foci is instrumental for identifying good candidates for this approach whilst maintaining safe oncological margins. In addition to this, the length of membranous urethra is an independent predictor of time to, and extent of, continence recovery. The introduction of Mp-MRI allows visualising malignant tissue within the prostate gland, which could lead to image-directed surgery planning as with other solid-organ cancers such as kidney, pancreas, breast or testes. A narrative review of the available literature was performed. Mp-MRI demonstrated moderate sensitivity and high specificity to detect extra-capsular extension, seminal vesicle involvement or T3 stage. 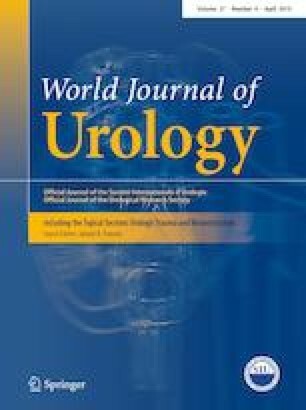 Measurements of membranous urethral length have shown to be useful in predicting probability of achieving continence after surgery. Furthermore, image-guided surgery has shown to be accurate to determine surgical planes to safely preserve neurovascular bundles. The use of Mp-MRI for pre-surgical planning introduces a new scenario where the previously homogeneous radical prostatectomy can be tailored to suit patient and tumour features. This has the potential to improve functional outcomes whilst not compromising on surgical margins. Moreover, the introduction of Mp-MRI increases the ability to predict functional outcomes after surgery and allows for a more accurate local staging. This in turn provides more information to both patients and clinicians in the decision-making process regarding treatment. JM: data collection and manuscript writing. CO: data collection and manuscript editing. TC and CM: manuscript editing. ME: manuscript editing and supervision. The authors confirm that all the funded sources were the following: none. Mark Emberton receives research support from the United Kingdom’s National Institute of Health Research (NIHR) UCLH/UCL Biomedical Research Centre. He has been an NIHR Senior Investigator since 2013. The remaining authors declare that they have no conflict of interest. Ethical standard was locally reviewed for this trial.